The ‘LEUCADIAN’: 13′-4″x36′, 1 bedroom, 1 bath 480sf CREST ‘BACKYARD’ HOMES by Silvercrest. 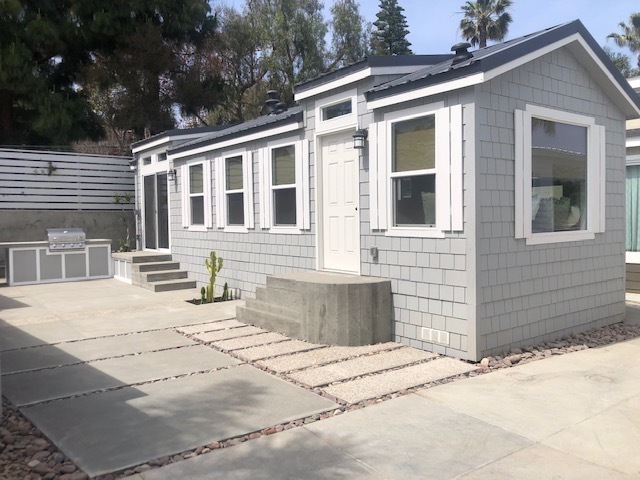 Accessory Dwelling Units aka Backyard Homes manufactured by Silvercrest Homes in Corona are now available from $53,230. Even when you add the engineering, site preparation, utilities, transportation, installation, and permits you could still have a CREST ‘BACKYARD’ HOME on your property in less than 4-6 months for under $100,000. However, transportation, installation (crane set if required) & setup, site preparation i.e. soils, civil and structural engineering, grading, excavation, trenching for utility connections, necessary utility upgrades, utility connections and installation and permit processing and related cost are not included in this price. We have seen these costs vary from $25,000-$45,000 depending on the local jurisdictional requirements and costs. Also note that if you are in an HOA community you must check your CC&R’s and get written permission from the HOA in order to install a BACKYARD HOME. Under the current State Mandate, SB 1069, the State has no control over private organizations such as an HOA. Some communities may not have an HOA but may have CC&R’s. Be sure to always check before ever starting an ADU or any home improvement project. If your property is on a septic system the very first thing you need to do is consult with your septic company and obtain a schematic delineating the size of your tank and the location of your leach field. Adding extra bedrooms requires making adjustments to your septic system. In some cases you may be required to install a dedicated septic system for your BACKYARD HOME. Adding an Accessory Dwelling Unit aka Backyard Homes to your property is not as simple as moving in a travel trailer or RV and plugging it in to the nearest electrical outlet. It is every bit as comprehensive, involved and expensive as building or installing any habitable dwelling. So please be sure you hire a design build contractor or architect who is experinenced with all the nuances, jurisdictional ordinances and building protocol that apply to your property. Do it right the first time and enjoy it forever.